Schedule Recording, Schedule Download, Using Scheduler. This tutorial describes how to use Total Recorder's built-in scheduler to schedule a recording, the playback of local audio and video files, and download (capture) streaming audio and video. As you gain more experience with Total Recorder, you will find other great options in the scheduler to help you conveniently produce recordings of the desired quality. The scheduler allows you to program Total Recorder so that it starts at a specific time, performs a required task (such as record or playback a file), and closes automatically. 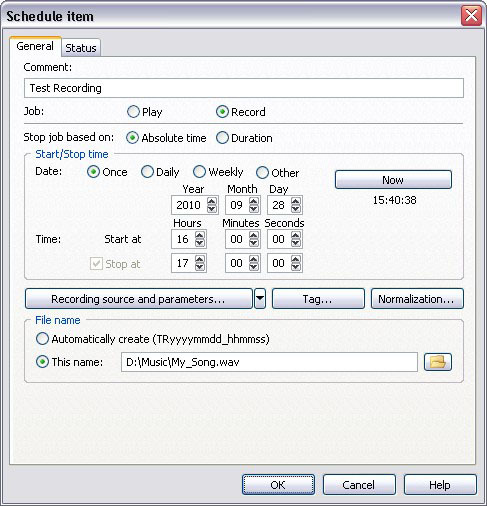 The scheduler's functionality for recording differs amongst the different editions of Total Recorder. To become familiar with the scheduling feature, we suggest you schedule the playback of a file. This procedure is very similar regardless of the edition (Standard, Professional, or VideoPro). To schedule the playback of a file, you need to indicate the time to start the playback, the location of the file, and the stop time. To create a new job, press the New button. The Schedule item dialog appears. This is where you specify all of the parameters for the scheduled job. At the top of this dialog, there is a Comment field. The content of this field is shown in the Record/Play Schedule window and can be used for sorting scheduled jobs. For a test playback, we suggest that you use a comment of “Test” for this job. Below the Comment field, there are three radio buttons, Play, Record and Background record, for selecting the type of scheduled job. For this test, select Play. In the middle of this dialog, there is the Start/Stop time panel. This is where you indicate the date, the start time, and the stop time for your scheduled job. You can use the Now button to set the current date and time as the start time for the job. The time when the job should stop is set as the current time plus one second. After that, you can modify these parameters manually. If you want to specify a stop time for playback, select the Stop at check box to the left, and enter your stop time. A file will be played continuously from the Start at time until the Stop at time, regardless of the length of the file. Without a stop time, the file will be played only once. Now you need to indicate the location and name of the file that you want to play. Use the File name field at the bottom of the dialog (the one with the yellow folder sign to the right). You can either manually enter the name and location of the file, or press the Browse ( ) button to browse for the file. Press OK to return to the Record/Play Schedule dialog. The job you have just scheduled now appears in the list along with its key characteristics, including its type, start time, stop time, etc. Save your changes in the list of scheduled jobs by clicking OK or Apply. Note that if do not save the changes before the start time, your scheduled job will not launch. Note that you do not need to leave Total Recorder open for it to start the scheduled job. The scheduler will open a new copy of Total Recorder at the scheduled start time. 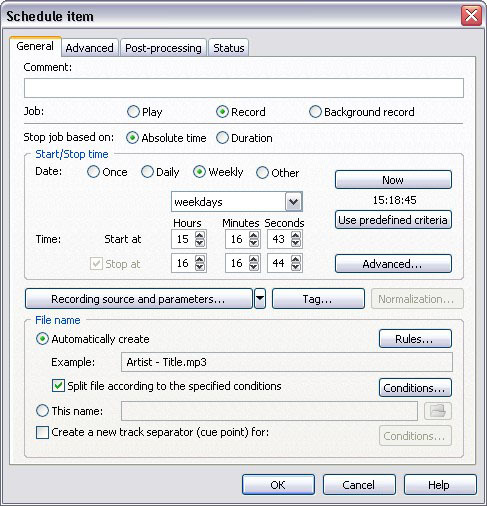 In the Standard Edition of Total Recorder, the scheduler will open Total Recorder at the scheduled start time and record the audio that is being played on your computer. This means that playback of the audio you want to record should begin prior to the start time of your scheduled recording. To schedule the recording of a file, you need to indicate the times for starting and stopping the recording, recording source and parameters (such as format), the name of the file that will be recorded, and the location in which to save the recorded file when the scheduled job completes. At the top of this dialog, there is a Comment field. The content of this field is shown in the Record/Play Schedule window and can be used for sorting scheduled jobs. For a test recording, we suggest that you use a comment of “Test Recording”. Below the Comment field, there are two radio buttons, Record and Play, for selecting the type of scheduled job. Select Record. In the middle of this dialog, there is the Start/Stop time panel. This is where you indicate the date, start time, and stop time for your scheduled job. You can use the Now button to set the current date and time as the start time for the job. The time when the job should stop is set as the current time plus one second. After that, you can modify these parameters manually. After setting the start and stop times, you need to indicate the recording source and parameters of your recording. For instructions on this, refer to the Setting Recording Parameters Tutorial. Now you need to indicate the location and name of the file that will be saved once the scheduled recording is complete. Use the File name panel at the bottom of the dialog. You can select either the Auto create option or the This name option. If you select Auto create, a file will be given an automatically generated name based on the current date and time when the job completes. The file will be placed in Total Recorder’s current directory. If you select This name, you can enter the file name and location either manually or use the ( ) button to browse for the file. Press OK to return to the Record/Play Schedule dialog. The job you have just scheduled now appears in the list along with the key characteristics of the scheduled job, including its type, start time, stop time, etc. With the Professional and VideoPro Editions, the scheduler not only lets you start Total Recorder at the required time and record audio being played back on your computer, it also allows the playback program to be launched each time a scheduled recording starts. Using the scheduler, you can also program Total Recorder to connect to a pre-defined Internet web site and play the transmission that you wish to record. The transmission starts and closes automatically. It eliminates the requirement for you to leave your browser active and connected to a web site when you have scheduled recordings of Internet transmissions. To record an Internet transmission, you should either obtain the full URL of the transmission, or tune Total Recorder's mini-browser on to this transmission. 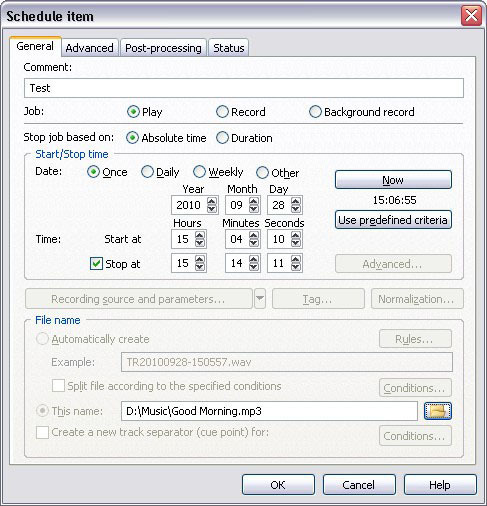 To schedule the recording of a file in the Professional or VideoPro Edition of Total Recorder, you need to indicate the times to start and stop the recording, the recording source and parameters (such as the format), the name of the file that will be recorded, and the location in which to save the recorded file when the scheduled job completes. You can select many other parameters that will help you attain the desired results. At the top of this dialog, there is a Comment field. The content of this field is shown in the Record/Play Schedule window and can be used for sorting scheduled jobs. For a test recording, we suggest that you mark this job as “Test Recording”. Below the Comment field, there are three radio buttons, Play, Record and Background record, for selecting the type of scheduled job. Select Record. If you don’t know the exact time your recording should stop, you can press the Advanced button to invoke the Advanced stop recording conditions dialog. Using this dialog, you can specify a stop time that is based on file size, a period of silence or low level of sound recorded. You can also indicate that Total Recorder should shut down your computer when the scheduled job completes. For example, you can select the option Stop recording if nothing recorded in nnn sec. if you do not want the recording of an Internet transmission to continue after the Internet transmission has finished, or your connection to the Internet has been lost. After setting the start and stop times, you need to specify the recording source and parameters for your recording. For instructions on this, refer to the Setting Recording Parameters Tutorial. Now you need to indicate the location and name of the file that will be saved once the scheduled recording is complete. Use the File name panel at the bottom of the dialog. You can select either the Automatically create option or the This name option. If you select Automatically create, a file name will be generated according to a template that you can create (see File Name Generation Tutorial). If you select This name, you can enter the file name and location either manually or use the Browse ( ) button to open a standard Windows dialog. Check the Split file according to the specified conditions check box if you want to break your file into separate fragments as it is being recorded. For more information on splitting files, refer to the Splitting and Tagging Files Tutorial. If you know the URL address of the transmission that you want to record, select the Run option and enter the URL into the text field. If you do not know the full URL of the transmission that you want to record, select Connect to Website and Play Internet transmission and press the Tune button to launch Total Recorder's mini-browser. Open the page from which you can start the transmission. Press the Capture transmission button and click the link that starts the transmission. Answer Yes to the prompt Save URL "..." as a location to play . Press Play to check that the transmission's URL is captured correctly. Press OK to save the captured URL. If you don’t want the sound being recorded to be audible during the recording (for example, you schedule a recording of a late-night broadcast), select Mute playback during scheduled job. If you want to close all transmission-related windows at the end of a scheduled recording, you need to select the option After job completes, close all windows with following string in title, and either select the string from the drop-down list or enter it manually.